Our Custom Farm Animals candy bar wrappers are an excellent choice for a great personalized baby shower or birthday party favor - who doesn't love chocolate?! These wrappers are sold in sets of 24 and printed on premium-grade paper with a photo-like shine that's made in the USA. Each one comes with a special message on the front and cute "nutrition facts" on the back. Your guest won't be able to stop themselves from smiling! They are designed specifically for Hershey's 1.55-ounce candy bars, and include the foil wrapper too. Our candy bar wrappers are easy to make, impressive to give and delicious to eat! Custom Farm Animals Standard Candy Bar Wrapper Kit INCLUDES 24 chocolate bar wrappers and 24 foils, perfect for styling an adorable barnyard animals candy buffet or unique Farm Animals baby shower or birthday party favors. 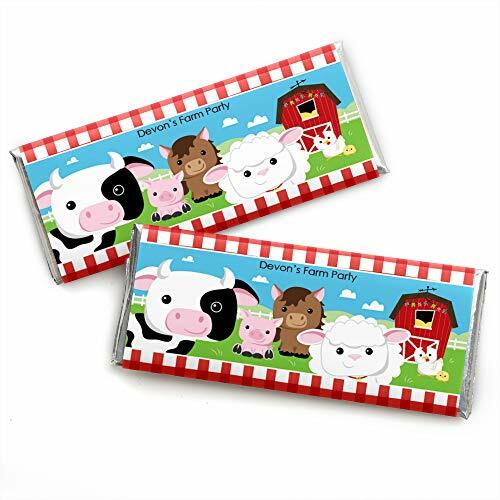 Farm Animals candy bar wrappers MEASURE 5.25 inches wide x 6.25 inches high and will quickly add a personal touch to all your sweet treats. It is easy to wrap Hershey's standard sized candy bars with these cute barnyard animal personalized Farm Animals paper wrappers and foils! EASY CUSTOM PARTY DECORATIONS: Personalized Farm Animals candy bars are an easy party favor to gift all your guests. Simply click "Customize Now" to add your personalized text to this cute party standard candy bar wrappers. Set a decorated candy bar at each placesetting, package in small gift bags as a party favor or display in a pretty bowl at your candy buffet. Get creative with your farm animals DIY baby shower or birthday party decoration ideas! PREMIUM PARTY SUPPLIES: Personalized Farm Animals chocolate candy bar wrappers are professionally printed on heavy-duty paper with a photo-like shine. They are individually inspected and carefully packaged by hand with silver foil wraps. Follow the included instructions to quickly wrap a foil around each chocolate candy bar and then add the printed paper wrapper, securing with tape. MADE IN THE USA: Custom Farm Animals - Personalized Baby Shower or Birthday Party Favors Candy Bar Wrappers are designed and manufactured at our Wisconsin facility using materials that are Made in the USA. Please Note: Candy bars are not included but are available at your local grocery store. Candy bar wrappers will fit standard 1.55 oz chocolate bars.